I am shutting down my shop which accounts to 75% of my income. 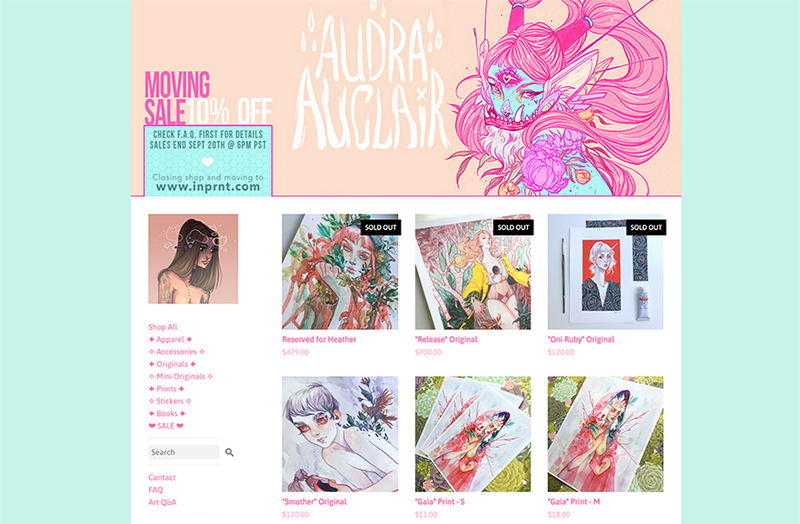 In all seriousness though I am finally moving away from Storenvy to another platform. I am doing TWO sales while I make this transition. This shop will be a 10% discount and my future shop will have a 20% discount. Just a little screen cap so I can reminisce later. Click here to go to my new shop! I'm having a 10% sale on the shop I'll be closing. I'll be closing it on the 20th. I'll also be selling via Society6 for a while but I'm not sure for how long because art thiefs. 1. The biggest reason is that I don't have the time to package and ship orders anymore. I had switched that job over to my partner, Lopi, but it was too much of a strain to keep up with orders. We found ourselves tired and unable to focus on our comic or other personal work. I've looked into various 3rd party companies and even logistics companies but I would still need to do a lot of customer service, photography, middle man work, etc.. For those who have been following me you probably know I struggle with my mental health and I feel like wearing so many hats has taken a toll on me over the years. I've also had a couple of the best years of my adult life, they have been so successful and I don't regret the path I've taken AT ALL. I think I just need a change and I want to take a step back. 2. I am wanting to focus almost full time on making my comic. Lopi and I have been putting off our comic since 2013! I have simply been too busy, but I want to take this time to focus primarily on the comic. Closing this shop is a VERY risky decision because I am actually losing about 75% of my income and that income supports me, my partner and our two cats. So I will be creating originals along the way, doing Twitch streams, the odd YouTube video, using Patreon plus printing through Inprnt, Society6 and Rhino Barking Sparrow. 3. Storenvy is no longer a platform I want to support. I've had a lot of issues with them in the past. It is hard to manage my income for tax purposes, they take weeks to respond or fix issues (sometimes never fixing them), their management seems to not really know what they are doing (read about this after doing some research online and it shows), and I basically just want a more professional setup that functions properly. It's not to say it won't be good for some people, I've had FAR more success on this platform than any other I've tried selling my artwork on but that's most definitely due to my own following because you peeps are brilliant human beings and you make my life. What is going to happen/change? - I am going to be closing Storenvy down. - I will transfer most of my art prints over to Inprnt. This means prints will no longer have my signature unless they are through Patreon or the odd gallery/3rd party. Since I live in Canada I can't often sign things for galleries but I will do my best to do some signed work. - I will also print exclusive prints through Rhino Barking Sparrow and galleries. - Originals will be sold through this site (the "originals" link) and galleries. - Patrons on my Patreon will get signed limited prints every month still (for now, I don't see this changing anytime soon unless it becomes too overwhelming). My Patreon will be changed to support the comic and Lopi/me as a pair since we are creating it together. - I will do my best to stream on Twitch frequently showing my progress on the comic. - I will also do my best to create YouTube content but for now it isn't a very stable platform as YouTube keeps making changes that hurt it's creators, either way I still want to try and make videos when I can. I would love to create comics that change peoples thinking for the better. I want to inspire people with them and give them an escape into a unique world. I want to learn more, I want to take courses to learn fundamentals I've missed and give myself the time to grow, to draw without sharing, to draw without needing to think "will this sell?". I want to create art books full of all of my random styles and subjects. I want to have a job that feels more like a normal job, to make time for myself, to have a healthy relationship with social media, to go outside and create, to travel and meet my followers at cons and to fall back in love with art. I feel like to do these things I need to cut out the jobs that I don't like that have become attached to my work, the ones that kept me from keeping balanced. I think it is possible, I know balance is something that you always need to struggle to hold onto but I hope it is easier to hold onto with this new direction. Thank you everyone for the amazing support you've shown me through my shop, I hope you will follow me as I create my upcoming artbook and comic. The comic won't be available until late this year, it will be a scifantasy webcomic. I will be posting progress on Patreon if you want to support the comic and follow along check out my Patreon. It's still in progress but it will be changed over to being focused on the comic over the next week (before Sept 20th).